Getting Started...Tiya Maria wants you to keep the following in mind before you decide on your big day. How many people do you want to attend, and how mobile are they? Does your dream wedding involve a small guestlist of close friends and family or a production crew of everyone you've ever met? Your answer may determine the location for you. Why? Even though the day is about you, it's also about them - your guests, that is. You have to anticipate the needs and limitations of your guests, otherwise, they may not be able to bear witness to your wedding. If many relatives are elderly, can you expect them to make it safely to the beach? You won't be able to please everyone, but consider making a concession or two if it means that our love ones will attend. Do you want a religious wedding? A traditional catholic ceremony are usually held in the place of worship. So in this case, book the date at your place of worship before you book your reception location. Also, some religious establishments frown upon elaborate decorations or picture taking, as well as skin-baring dresses, so ask about details. If you and your fiance have different religious beliefs, consider a neutral location, like a garden wedding or a reception hall, so you won't offend any of his/her families. Most commonly referred to as a "Civil Wedding". Talk early on with both families about your decision. If organized religion does not play a role in your lives but want to incorporate a spiritual element, consider hosting the ceremony in a natural setting, such as a beach or a park. A piece of advise: Booking a location four to six months away from the date may prevent you from blowing your whole budget. If a site isn't booked within that time period, they might negotiate with you to get some business, rather than have no business at all. Going for a Church Wedding? Or perhaps you'd rather say "I do" in a garden? Maybe you're still not exactly sure what you want. No matter where you stand, here's what Tiya Maria came up with to help you make your choice. What it is: A religious ceremony, often in the bride's hometown (In the case for Catholics, bride's local parish), followed by a party at a reception hall. Good for: Couples with religious ties, a significant connection to a hometown, and a sizable guest list. Many halls in Davao can accomodate 100 to 400 people and come complete with everything you need (Silverware, dinnerware, food, alcohol, and linens). Most halls have wedding packages to help you seek your budget. 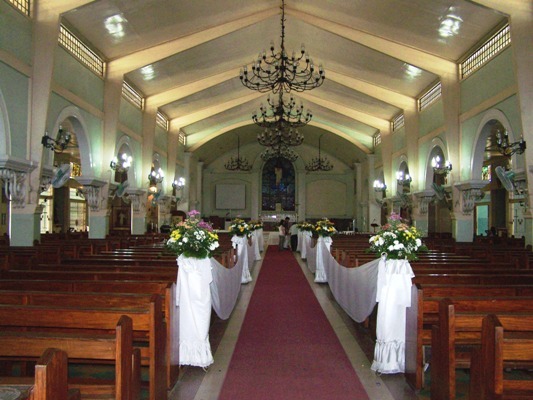 What to know: Though Davao is prevalently Catholics, other religious place of worships are also available for wedding ie: Buddhist Temples, Mosques, Hindu Temples, and Protestant Churches. What it is: A ceremony at someone's residence or if not available, at a garden in an establishment, like a hotel. Good for: Twosomes with a connection to a childhood house or with access to a grand home, a pair who want a more, well, homey celebration in their own pad, or just a couple with differing beliefs, who wants a neutral ground. What to know: When done in a home, it might seem as if a backyard wedding could be a money saver.... it just might. But, this will terribly stressed you out. No, you're not spending a fortune for a per plate cost at a reception hall, but consider the extras you'll be responsible for. Tables, chairs, linens and the not so thought about, extra restrooms you'll need. This will be a totally different situation if done in a garden by an establishment. Usually they will cater to all the extras that you'll need. One question to ask though is: What is their back-up plan just in case the weather turns sour? What it is: A getaway - usually somewhere exotic, like a resort - with activities that span a weekend. Good for: Duos who have a connection to a location or want just close love ones (up to 75 people) to attend. 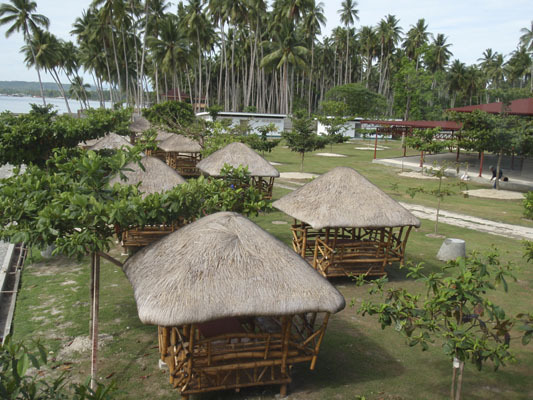 Samal is the best and most preferred choice for this type of event and if your inclination is towards the mountainside, then Eden would be a sound choice. Many resorts offer all-inclusive packages for everthing from a guest welcome to a farewell brunch, making the planning a cinch. What to know: Transportation would be a problem if the resort is located on the opposite side of the ferry terminal in Samal. You would have to somehow avail of a boat to cross the Davao Gulf. While you're at it, make sure that your guests are mobile enough to get in and out of the boat. What it is: A ceremony somewhere off the beaten path. This is something out of the ordinary where your imagination takes over. Not very popular in conservative Davao, but is not impossible. Good for: A couple who wants a unique event. Costwise, price tag are all over the map, but it's possible to bargain at these locations - weddings aren't their primary source of business, so the numbers may not be set in stone. What to know: Like the cost, could be all over the map, as this endeavour could be anything out of the blue. Just one thing, though, make sure it's safe. We apologize that Linmarr does not offer this type of wedding ceremony, but Tiya Maria would still love to hear from you.... if you do, email me at contact@linmarrdavao.com c/o Tiya Maria and I'll post the pictures at our site. Since there are no standards, the resources can be astounding. So, therefore, I leave it up to you and your imagination to fulfill this dream. Take a peek at the recent wedding events that just happened at Linmarr. A wedding pictorial gallery you don't want to miss! Featuring thousands of pictures to inspire you (please allow time to load). How do I find out about the venue's policies so that they are not sprung on me at the last minute? What types of alcohol can you bring in to the establishment? Are there extra charges if we bring our own? What types of lighting are allowed? Candles with open flames are not always welcome - Fire Hazard. How early can you and your team get into the venue set-up? Yes, you can bring in your own wines and liquors but we do charge a minimal fee(corkage). You can also bring in beers & softdrinks and our policy with the corkage is 1 is to 1. That is, if you bring in 5 cases of beers & 5 cases of softdrinks you have to double-up and give us the same number of cases that you brought in. We only accept San Miguel, Coke, and Pepsi products. Any type of lighting are allowed, including candles. We can start and finished the set-up a day before the event. But if you wish to have it earlier please let us know and we might be able to accomodate this. Do I have to use the vendors that have deals with my chosen reception hall? Some venues expect you to use their own caterers and florists. You can sometimes veer away from this, but at a hefty cost. You might have to pay a fee to the house vendors for not using them, in addition to paying your own vendors. We don't have any fixed suppliers. We instead, advise our client of the necessary supports and probable things that they would need ie: videographer, photographer, make up artist, props, and etc. If our client are at a lost on who to get in touch with, then we can refer them to the right direction. We have an inhouse team that can do the backdrop, floral arrangements, and catering. It would be part of the wedding package that we offer. For the backdrop, the client has a choice for the text, font, and color. For the floral arrangement, we do suggest the flowers in season that are available during the months of their wedding. Usually we provide the flowers and we decide on the arrangement. But, if a client has a preference for the choice of flowers and the type of arrangement then we do charge an extra fee. This can be discussed with our cost controller to determine the exact amount of the fee. For the catering, our chef have perpared a beautiful set menu for the buffet table. Please inquire within. Now, if the client have their own wedding team (Florist, catering, etc. ), we do allow it, but we only ask that they would coordinate with our people handling their function. How do I coordinate transportation for my guests to and from the ceremony? Before the ceremony: Transportation should start arriving one hour before the ceremony, up until the ceremony. After the ceremony: Vehicles should be waiting, then be available until a half hour afterwards (guests linger to offer good wishes). After the reception: Vehicles should be available immediately, and until 30 minutes post-reception. As part of our wedding package, we offer a free transporation (bridal car) for the newly-wed couple(only). We can take them to any church for their wedding ceremony and back to the hotel. The car is available for 3 hours and in excess to that, we charge P 200.00/per hour. Please Note: The routing of the bridal car is limited from Linmarr to the church and vise versa only. What should I do if the weather doesn't cooperate on my wedding day? Make sure you have contingency plan in place - and use it. Even if you're holding the wedding indoors, consider how to make traveling from the car to the hall more comfortable for the guests. Make sure that the reception hall have adeqate supply of umbrellas. 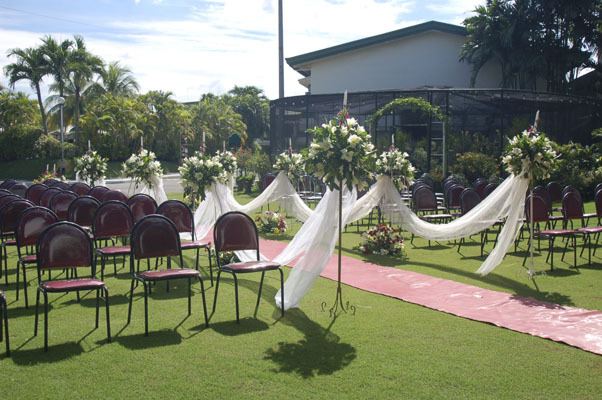 If the ceremony is held at the La Orchidia Garden of Linmarr, a reserved spot will be held at the Ballroom de Linmarr as a back-up. We will inform the client of an impending bad weather (usually an hour before) and all function set-up will be transferred. The venue I want comes with a facility director. What is his role? The facility director serves as the man behind the curtain at the reception. This person is responsible for things like timing the food presentation and all servers are in their places. Because the person works for the facility, he or she is your go-to person should anything go awry. Be sure to get a list of the director's responsibilities and confirm his or her attendance at the wedding before you sign the contract. Linmarr will assign a facility director to assist the client or wedding coordinators before, during and after the event. What should I plan for my guests from out-of town during the wedding weekend? 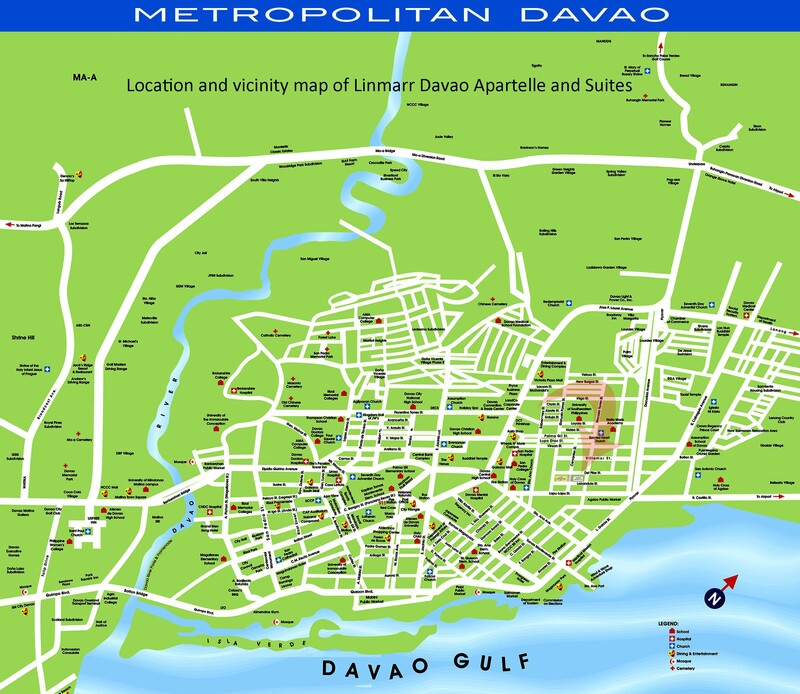 A list of places to see and do around Davao. Our friendly staff at the front desk should have all the necessary information that you seek. We have a comprehensive listing of other establishments such as restaurants, hotels, taxi services, car rental service, beach resorts, and mountain resorts. We can also provide a telephone directory and maps of the city and of the province for your convenience. Am I expected to pay for guests if I'm having a destination wedding? In a word: no. You're expected to pay for the wedding-night dinner and the activities that's included in a package. There are many extra events you could shell out for, but no guest will expect a free flight and hotel stay. Am I required to give my guests flight information? Contact your guests who are inexperience travelers and help them create an itinerary.